Every year, the Hugs Project sends hundreds (if not thousands) of care packages to our troops serving overseas. The Hugs Project is based in Oklahoma, providing "Hugs" (cooling wraps) to service members as well as other necessities that aren't easily available at their duty stations. It's an important and very needed service that sometimes is difficult to understand for those who have never served. For military personnel serving overseas, anything received from home is like a ray of sunshine. Being separated from family, from familiar surroundings and facing the dangers of being an active duty service member is stressful. Fear of loss, wondering what's happening back home, the thought of possible death is intense and even a postcard can restore a few moments of peace. The Hugs Project does just that - sends our troops pieces of home and it has gotten expensive. Postal rates have increased and it isn't as though the federal government has opened its wallets and decided that communications from home are a top priority for our service members, but you know, the Hugs Project takes on this task with vigor and a sense of duty. 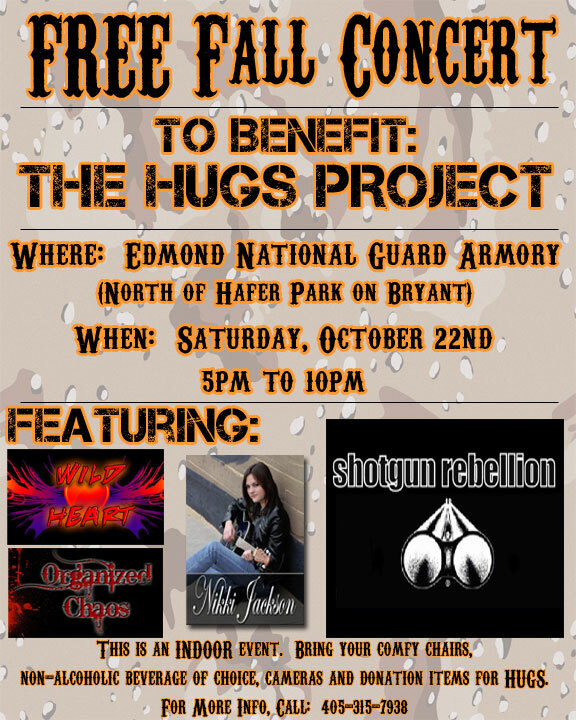 On October 22nd at the National Guard Armory in Edmond, just north of Hafer Park, there is a fundraiser/music event to help the Hugs Project raise awareness and some much-needed funds to get that last influx of revenue to pay for Christmas mailings to our troops before the holidays. Nikki Jackson - An up and coming local talent who performs a folk/country style with a great deal of flair. Wild Heart - An established progressive country band featuring the vocal talents of Tonya Mandrell, singing everything from Sugarland to Gretchen Wilson. Organized Chaos - A new band (mine) with Tad Osborne and Jennifer Leigh (from KMGL) on vocals, Rick Jackson on bass, Jim Blalock on drums and myself on guitar. We will be performing some Tom Petty, Heart, Billy Squier, The Cranberries, and even some Cash. Shotgun Rebellion - An Oklahoma band that is absolutely incredible. Their style of red dirt rock is unsurpassed and has been the influence of many new Oklahoma bands. Their new guitar player is a veteran of the Iraq war and has an incredible story. Watch this video about the Hugs Project. 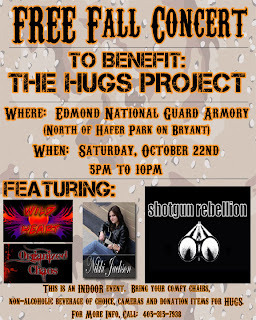 Again, it is a FREE event that is family-friendly and it is all about supporting our troops and those who support the troops, namely, the Hugs Project. You're cordially invited to be a part of this event that we hope is a blessing to you and we KNOW it will be a blessing to the troops. There are a lot of opportunities to serve non-profits in Central Oklahoma, but there are few with the magnitude of this one.